Brian Hall is one ex-Claret who won't be remembered in the game for his time as a Burnley player; Turf Moor being where he spent his last two years as a player. He joined us from Plymouth in November 1977 on the same day Steve Kindon returned from Wolves. Burnley were languishing at the foot of the second division at the time but had a wonderful run later in the season that brought about a recovery when relegation was looking almost certain. Hall's career had been spent mainly with Liverpool under the management of one Bill Shankly. He was 22 by the time he made his debut in Liverpool colours in April 1969 but that was because he hadn't turned professional in the game until after he'd graduated in mathematics. He was one of two graduates in the Liverpool team, the other being Steve Heighway, and they were always known as Big Bamber and Little Bamber by the Anfield crowd with the diminutive Hall getting the latter of those nicknames. For the next four years he was very much a regular, although during one spell out of the side, and with no sign of a recall, he decided it was time to ask for a transfer. He plucked up the courage eventually to go and see Shankly, transfer request in hand. On arrival, Shankly (clearly tipped off) confirmed he was pleased to see him because he wanted to tell him he was back in the team on the following Saturday. Hall, like so many before him, was left speechless, mumbled a thanks and left the manager's office. Hall played over 150 games for Liverpool, including the 1974 FA Cup Final against Newcastle which was Shankly's last game in charge. He won league titles as well as that FA Cup winners medal and was also involved in the UEFA Cup Final of 1973 when Liverpool defeated Borussia Mönchengladbach. When Bob Paisley became manager from the 1974/75 season he found his place less secure. Liverpool had signed Jimmy Case from South Liverpool and Ray Kennedy from Arsenal and Hall found himself fading out of the first team picture. That led to a move to Plymouth in the summer of 1976 and in his one full season at Home Park he was leading goalscorer. It didn't help and Plymouth were relegated from the Second Division. He was still there at the beginning of the next season but a desire to move back north saw him join Burnley just over a year later in a £25,000 move. We were rock bottom, miles adrift, and days before the double singing an under pressure Bob Lord was targeted at the club's AGM with demands of what he was going to do about it. He told shareholders there would be a double signing before the next game. That dug him out of the hole but he was true to his word with Kindon and Hall lining up against Notts County as the Clarets won 3-0 on the following Saturday. Hall lost his place at the end of December to Billy Ingham with Burnley still bottom but a lot closer to the pack and, as the revival got underway in March, he watched from the sidelines making only one more appearance and that from the bench. He played much more regularly in the 1978/79 season and was in the team for the first leg of the Anglo Scottish Cup as Burnley went on to win it. He only scored three goals for Burnley but two came in that season with one of them a very important goal. With us 1-0 down to Blackburn Rovers at Ewood Park it was Hall who scored the winning goal, a goal which remains at this time the last winning goal ever by a Burnley player against Blackburn Rovers. It was his last goal for Burnley and there weren't too many more appearances. He played five games in the following season which were the last five Harry Potts was manager. He was one of the players left out by new boss Brian Miller for his first game in charge at Preston. 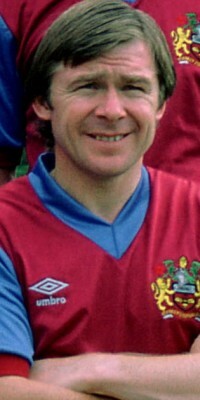 Hall didn't play for Burnley again and retired from professional football after being released in May 1980. He played non-league football for a while and professionally went into teaching, but he returned to Liverpool Football Club in 1991 and is still there today, as Head of PR at Anfield. He was a player well past his best by the time he arrived at Burnley - but for the winning goal at Ewood alone he should be remembered with some affection. Brian Hall sadly passed away on 16th July 2015 at the age of 68 after he lost his fight against leukaemia.